Pedro García Morales (center), partner of Garrigues in Santiago office, picks up the award. 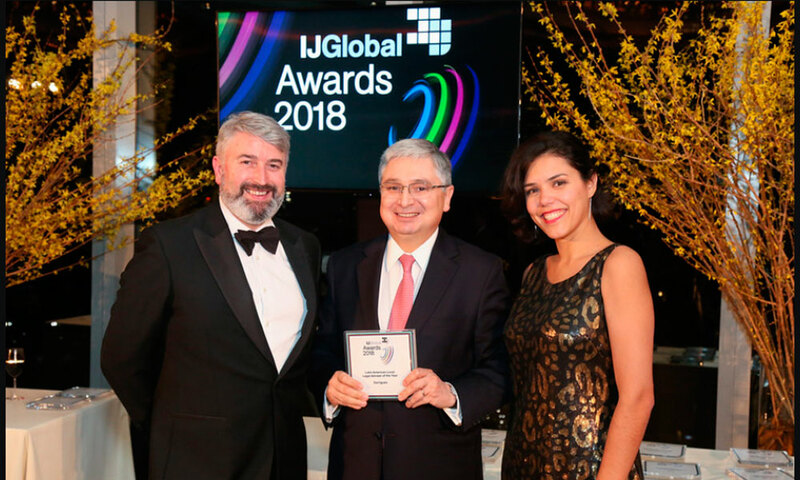 Garrigues was named the best infrastructure firm in Latin America as part of the annual IJGlobal Awards, which recognize the region’s best advisors in infrastructure and project finance. The award was given in ceremony held in New York, which brought together the main companies and firms operating in Latin America. The IJGlobal judging panels, comprising company executives and advisors, selected the most innovative deals performed in Latin America in the past year and acknowledged the work of the main players involved, including investors, banks and law firms. In assessing Garrigues’ work in the region, the judges took into account the economic and social impacts of the deals led by the firm and the innovation reflected in its advisory services. Three transactions in which Garrigues’ Chile, Colombia and Peru teams advised took home awards for the best deals in Latin America in their respective categories: the syndicated loan for construction of a desalination plant at Spence copper mine in Chile (Latin American Water Deal of the Year), the Ruta del Cacao concession project for construction of a motorway in Colombia (Latin American Roads Deal of the Year), and the syndicated loan for Petroperú for modernizing a refinery in Peru (Latin American Downstream Oil & Gas Deal of the Year). Garrigues’ commitment to this sector led the firm to recently launch a web portal, a first in the region, featuring information on 80 landmark projects that will shape future development in Brazil, Chile, Colombia, Mexico and Peru. Garrigues has own offices in all five of these countries, as well as solid teams with expertise in the main areas of business law.